I have learned a lot from you in the short time I have known you. Your a wonderful person! I have learned to push myself and try my hardest no matter how hard finishing could be. I have learned about dyslexia and how tough having it could be. I have also learned about facing bullies and to always stay strong. I hope to see you in the future but, in the mean time I hope you will continue to learn to read and help Travis read as well. I also hope you will continue being best friends with Keisha and Albert. Also continue to draw because you are an amazing artist! I want Ally to finally know how to read completely and easily. I also want her dad to come home from the war safe and sound. The reason I want Ally to know how to read is because school will be so much easier for her, and nobody will bully her for not knowing how to read. She wont have to sit and worry about doing writing assignments she will want to do writing assignments. I want her dad to come home because they can finally be a complete family again and get more money to live then what Travis and Allys mom are getting. In the end I also want Albert to stand up to the boys hurting him AND be able to get food at home. I want this so Albert can be happy and not be hungry or hurt. If I could have lunch with any character it would be Ally because I would tell her that different is good and that if she would tell someone what is up with her she would get help. I would also say to her that she has two amazing friends. Plus she seems really friendly and nice to be around. 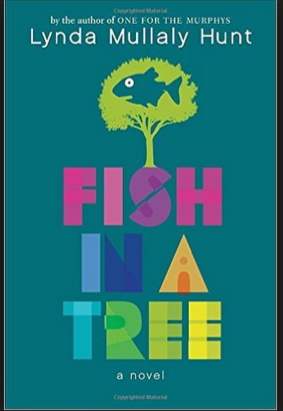 I'm a Fish In A Tree because im VERY talkative. Ally Nickerson is in her class trying to write a paragraph about herself. But she cant. When she writes all the words get scrambled on the page. Her teacher Mrs. Hall keeps getting her to try but she cant. But nobody really knows. Finally she try`s but only writes Why? Why? Why? Over and over again. The next day Mrs. Hall is having a class baby shower. Ally bys Mrs. Hall a pretty flower card. At the baby shower Mrs Hall reads the card and cry`s because it was a sympathy card. Ally gets in trouble and misses the bus. She walks to her mothers work (restaurant) were her mother is and talks to her. Then Shay and Jessica walk in a be rude. Her mother tells her to talk to friends and it ends badly. A connection to me from the book is that Ally is in 6 grade and I am in 6 grade too. Possible Novel Themes: Living with a learning disability. A girl is failing, but what is failing?, Friend sees her for what she is, Building off of individual strengths, overcoming obstacles. Predictions: Ally has a problem she cant solve but she finds friends who also have problems so when she and her friends work together they find out how to overcome there problems together.